Information on the biggest regulator of them all, the proposed Pomanda Weir. One of the larger pumps at Clayton has been brought online and that the remaining units should be pumping by the middle of next week. Most of the water in the Goolwa channel to-date is as a result of runoff from the Finniss River and to a lesser degree, Currency Creek. Currency Creek regulator back under construction, this time with sand. Clayton regulator information and photos. Lateline video on the Clayton regulator. 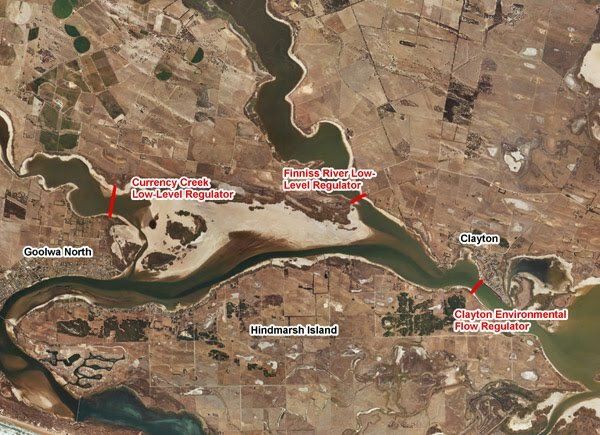 "Construction of Goolwa regulators starts this week"
"Public information sessions outlining the construction schedule and details will be held this Thursday, June 18, at the Clayton Bay Community Hall, from 2-3pm, and at the Alexandrina Council Chambers in Goolwa from 4-5pm." Read about what went on at the meetings in Goolwa and Clayton Bay. Subpages (7): Clayton Regulator, 16 August 2009 Clayton Regulator, 31 July 2009 Clayton Regulator, 9 August 2009 Currency Creek Regulator, 10 August 2009 Currency Creek Regulator, 5 September 2009 Pomanda Weir Regulators abandoned...or in need of a variance?